Titan Entertainment celebrate Ronald D Moore’s inspired re-imagining of Battlestar Galactica with this debut range of 2004 Series TITANS arriving in 2014 – the first release in an ongoing series of both contemporary AND classic Battlestar Galactica TITANS! This twelve-piece set of 3″ blind-boxed TITANS celebrates Battlestar Galactica’s epic struggle for survival in the wake of near-extinction by the inhuman Cylons. 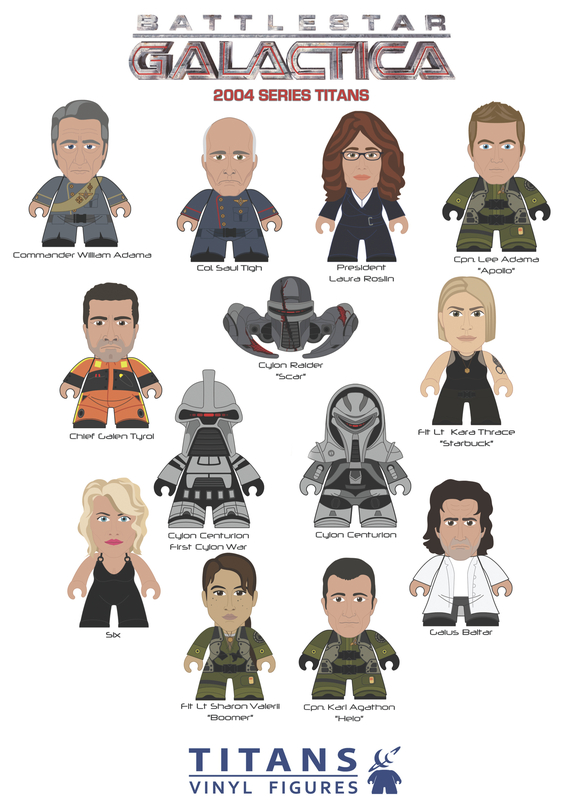 This debut set includes all of the show’s most popular characters, including the brilliant-but-narcissistic Dr. Gaius Baltar, the ever-evolving Viper pilot Kara “Starbuck” Thrace, President of the Colonies Laura Roslin and legendary military leader William Adama. Also included is a deadly Cylon Centurion and the infamous Cylon Raider “Scar”. Each figure is 3″ tall, foil-wrapped and blind-boxed. PLUS: 4 hidden super-rare chase figures for you to hunt and collect! And many other specialist retailers worldwide!